If you work as Lotus Domino administrator you might get an issue that outbound email from some user got to Internet recipients with a wrong sender's address so they can't reply on it. In the most of cases such things happen when user works with laptop/workstation that belonged to another person. 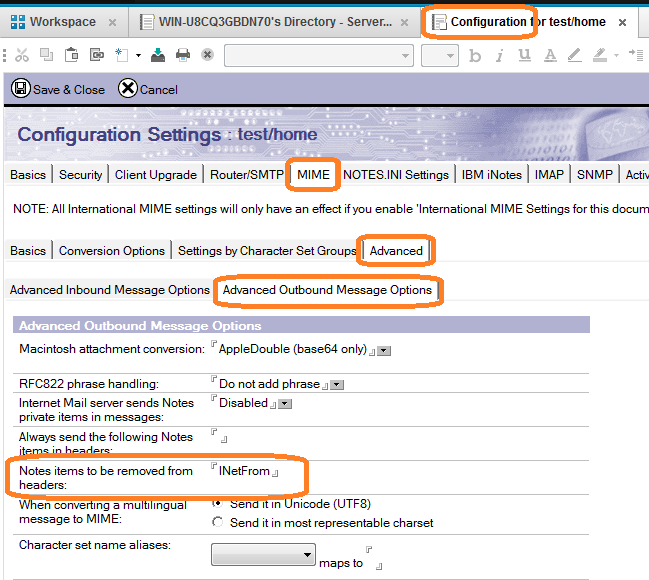 Lotus Notes rich client was already installed there and configured for previous user when new user just uses his id-file to work with mail database without Lotus Notes reconfiguration. Another example is that user might change his name (because of marriage or religion or any other reason) and asked Lotus Domino administrator to change his name in Domino Directory together with his email. In this case "Dynamic Client Configuration" should update location document automatically but this does not happen always . In such case all emails from this user sill go to Internet with his old Internet Address. So why it happens and what to do? I am sure we all know why - because of "Internet Address" field in a location document of a local names.nsf. This value, from the "Internet Address" field of location document, gets to the email item "INetFrom" that is used by Domino router for making a sender's internet address when email goes to Internet. That's why I Googled a little and found a hint how it can be fixed. 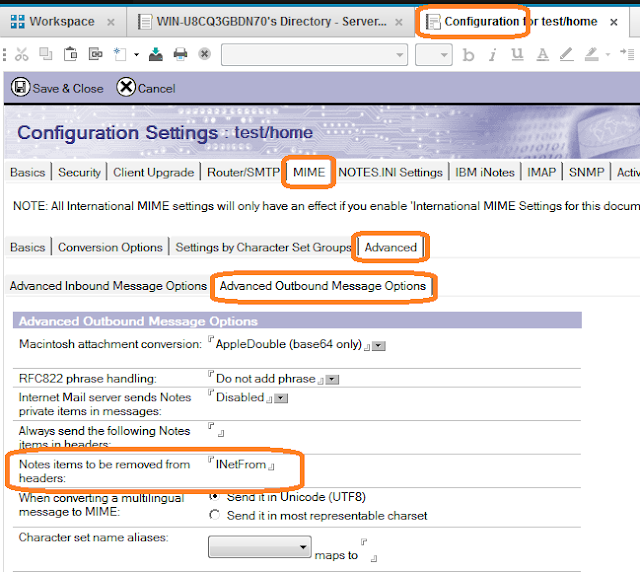 We can configure Domino server configuration to remove "INetFrom" item from email header and in this case Mail router will use "Internet Address" from the Person document for emails which are going to Internet and this is exactly what I wanted since I can control users' Person documents. Just do not forget to restart Domino router. Thank you! This was very helpful for me! Thank you for the interesting post. Do you think, it would solve our problem:we had a lot of names changes in Domino (changes in naming conventions, plus some users send mail from pop3 clients because they don't like iNotes). The problem is, that when users use iNotes client to serch mail received from specific user, they only get mails for the exact domino name used in the search phrase. It can be confusing, since sometimes you have to search with 4 or more exact phrases to find all mails for specific users and you can never get all mails for specific users with one search. Thank you in advance for your answer. Excellent... we're in the middle of a merger, and litteraly need to change every employees e-mail address from one day to another. In my company we use "department address" + personal address. Who receive the mail have to see only the dept address. There might be an easier way to achieve that. Great, thank you, I will check if it works.